-Read the excerpt from Reuters.com. Jon Stewart says the worst part about conservative complaints of media bias is when they contain “a kernal of truth” — and that conservatives have a point about Newsweek’s unflattering Michele Bachmann cover. The cover describes her as “The Queen of Rage.” Stewart called Newsweek out on Tuesday’s “The Daily Show” for using cheap attempts to undercut the Minnesota representative and Republican presidential candidate. He mocked the magazine’s statement that it ran the photo to capture the way she has galvanized Iowa voters. 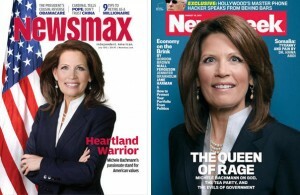 Photos of Rep. Bachmann from two different magazines: Newsmax and Newsweek. “I get it, Newsweek,” Stewart said. “You put in ‘The Queen of Rage’ juxtaposed with a picture of a lady that appears to be enchanted by simple math being done on a blackboard that’s been hung too high. Or maybe it’s a child thinking of cake! “But. Be honest Newsweek. You used that photo in a petty attempt to make Michele Bachman look crazy. And that’s what her words are for. …You want a photo that makes her seem a little off? Make it out of her words.” He added: “Shame on you, Newsweek. And your editor, Tina Brown,” before posting the least flattering Brown photo he could find. From Reuters.com. Newsweek magazine is denying claims it purposely used an unflattering photo of conservative Republican presidential candidate Congresswoman Michele Bachmann. The headline reads “The Queen of Rage” and shows a crazy eyed photo of Bachmann. Newsweek is defending its photo choice saying, “Michele Bachmann’s intensity is galvanizing voters in Iowa right now and Newsweek’s cover captures that.” But critics still argue it’s another example of Newsweek portraying conservative women unfairly. In addition to liberal TV host Jon Stewart, the liberal group National Organization for Women, who wants to see Bachmann defeated, is rallying to her defense. 1. Do you think Newsweek picked that photo on purpose to portray Rep. Bachmann as being unhinged? Explain your answer. 2. Do you think Newsweek’s choice of photo shows bias? Explain your answer. 3. Do you think the media in general is guilty of doing this to politicians, and if so, Democratic and Republican politicians, or only Republicans or only Democrats? Explain your answer.